Of the additions which Henry made to the Palace, the most celebrated was the King’s (later known as the Painted) Chamber. 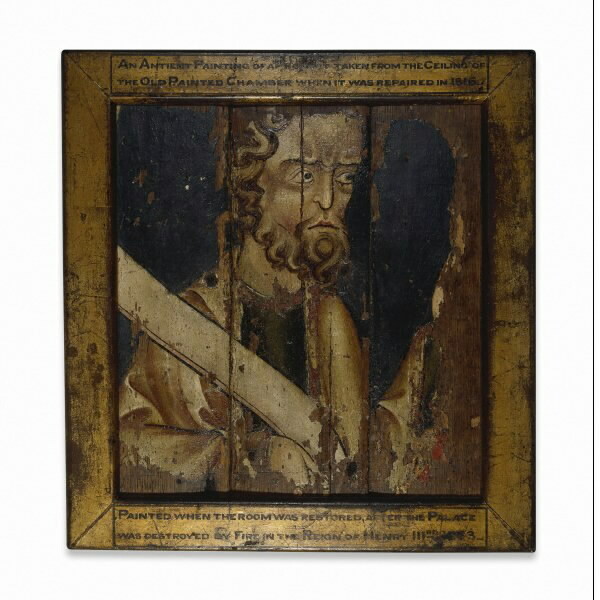 The chamber itself no longer exists, however, it is possible to gain some idea of its sumptuous decoration through two surviving ceiling panels (now at the British Museum) and the early 19th-century watercolours by Charles Stothard (Society of Antiquaries of London). The ceiling was painted and punctuated along its length and breadth with polychrome bosses. The surviving panels from the ceiling are exquisite and depict a seraph and a prophet. The biblical theme was continued through the wall paintings, which illustrated stories from the Old Testament. In the centre of this glorious profusion of colour was a canopied state bed. Beneath the canopy a large painted and gilded scene of the coronation of St Edward the Confessor took pride of place.